I had an awesome surprise when I went shopping at Aldi today: packages of summer and perennial bulbs and rhizomes for just $1.69, $4.30 less than what had been advertised in the weekly circular. 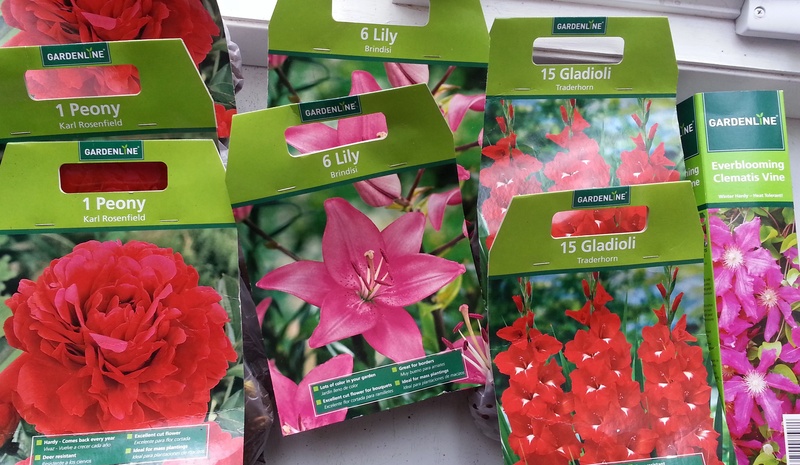 Thirty red gladiolus bulbs (red – great for attracting hummingbirds), four sets of peony rhizomes (also red – notice a pattern here? ), and 12 Asiatic lily bulbs. I also splurged on a clematis for a whopping $5. Hopefully that will take care of my plant-acquisition itch until fall, when I won’t be able to resist getting a few more tulips and crocuses to blanket the garden next spring. All gorgeous. A super investment, I'd struggle to pass on it also.